“Well, crouch down as far as you can, and then jump up as far as you can,” said the frog. So the mouse did. He crouched down on the river bank until he was a tight little bundle, and then he leapt up into the sky. He jumped higher than the flowers, and then the trees, nearly scraping his ears on the branches. He went higher and higher, and then across the trees he caught a glimpse of the Sacred Mountains…. 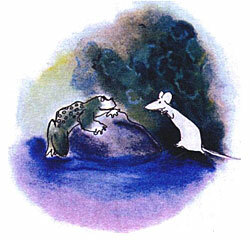 And so the little mouse was named Jumping Mouse by the frog, and he started his journey to the Sacred Mountains. Jumping Mouse re-tells a classic Native American hero story about how a little mouse had the courage to leave his family’s warm nest in the roots of a giant tree, find his true name, and journey to the sacred mountains.